Extend an existing HDMI cable by 1 metre. HDMI high speed with ethernet. Ethernet Channel for connected devices. Is this an HDMI 2.0 Cable? This cable is suitable for all HDMI versions including 1.4, 1.4A, 2.0 and older. 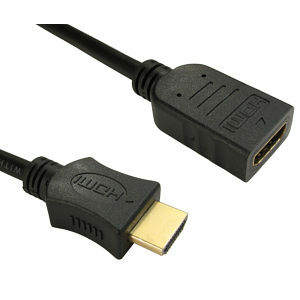 There are no different cables for HDMI 2.0, visit our HDMI 2.0 Cable information page for details. What devices will this cable work with? Our HDMI extension cables are perfect for extending your existing HDMI Cable, availabe in lengths from 1m to 10. HDMI to VGA Converter with Audio. Convert an HDMI output to VGA plus 3.5mm Audio. Easy to Use: Installs in seconds and does not need drivers. 3.5mm stereo output connector. Built in HDMI cable. Input HDMI. Output VGA HD15 plus 3.5mm audio socket. HDMI Switcher 2 Way with Automatic HDMI Input Selection. Allows you to connect 2 HDMI source devices to a single HDTV display or projector and switch between them. 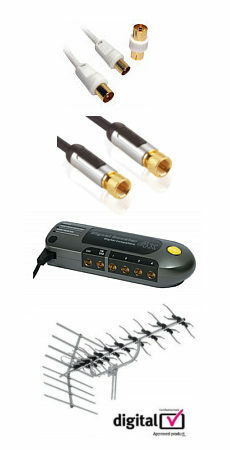 Ideal for use with high definition set top boxes, satellite receivers, DVD players and computers . Automatic switching. Very neat and compact design . Supports HDTV resolutions of up to 1080p and multi channel digital audio. Supports cable runs of up to 15m out. HDCP compliant for trouble-free operation. HDMI Extender / HDMI Cable Repeater HDMI Cable extender, allows HD signals to be transferred over long distances up to 40m eg 35m cable, extender plus 5m cable. Up to 4 extenders and be daisy chained to make a maximum run of 145m, 4x 35m + 5m cable from last extender. DHCP compliant. Suitable for all HD resolutions including 720p, 1080i and 1080p. No power required. Easy to install, small size. High Speed HDMI Cable with Ethernet, Audio Return Channel and Right Angle Connector 1.5m. Supports HDMI 1.4 and HDMI 2.0 functions; ethernet channel, ethernet via HDMI and audio return channel to send audio back from a display to source. Supports 3D over HDMI, 3DTV, Sky 3D and 3D Blu Ray. Supports 720p, 1080i, 1080p, 2160p and 4k x 2k (4096 x 2160). Supports extended colour spaces eg x.v.colour. 99.99% Pure OFC copper cable. 24k Gold plated 19 pin HDMI A male connectors. Metal shelled connectors with right angle one end provide enhanced shielding and easy installation in tight spaces. Ferrite supressors reduce the risk of interference. Mylar backed foil shielded oxygen free copper twisted pairs for high speed HDMI. Backward compatible with HDMI 1.0, 1.1, 1.2 and 1.3. Ideal for connecting 3DTV, Sky 3D, 3D Blu Ray, PS3, XBox 360, Blu Ray DVD, Sky HD, DVD Recorders, Virgin Media HD, Freesat HD etc. Length 1.5 meter.